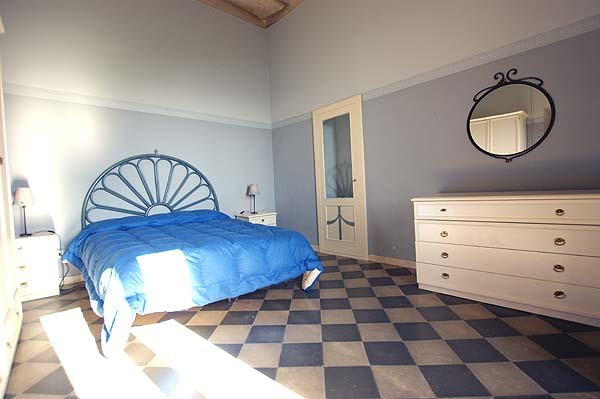 It is in a former church, which dates back to the 12th century and where, until the beginning of the 19th century, the bishop of Pisciotta celebrated workday masses, that family De Bellis’ holiday apartment Casa Marida waits to welcome you. The historic building is found right in the middle of the car-free, medieval center, somewhat below today’s village church and in wonderful panoramic hillside location. The two balconies of your holiday apartment in Southern Italy open upon a gorgeous panoramic view across Pisciotta’s terracotta-colored rooftops and the silvery-green olive groves as far as the sea and the Cape of Palinuro. Inside Casa Marida, rooms more than 4 m in height and 100 m² of living space provide for a sense of spaciousness. The holiday apartment includes a very spacious living room with dining area, couch, sat-TV (with English channels) and French balcony, an eat-in kitchen with modern fitted kitchen units, two bedrooms and a bathroom. Wall colors chosen with a sure sense of style, decorative borders and friendly furniture create an inviting atmosphere in the living and bedrooms of Casa Marida. One of the two bedrooms is furnished with a double bed; there is also an infant bed in this room. The couch in the second bedroom, which is a pass-through room, can be converted into a double bed or two single beds. This room offers access of the south-facing balcony, where you can enjoy your meals, a glass of wine or an aperitif in the shade of a parasol and at the same time the marvelous view of the sea. The bathroom is equipped with shower, WC, bidet and a washing machine. Should you be at Pisciotta for the first time, you might get the impression that time there seems to have been standing still. That makes for the special charm of the small mountain village, which yet, year-round, displays an 'active' village life and a sense of togetherness you can almost touch. At the village and only ca. 100 – 150 m from Casa Marida, you find whatever you need during your holidays: several small supermarkets, a piazza with bars and newsstand, a greengrocer’s, a store selling local fish specialties (Alici di Menaica), a car, bike and scooter rental, restaurants I tre Gufi with breathtaking panorama terrace and Il Borgo with fresh local cuisine. The beach of Marina di Pisciotta is at a walking distance of ca. 1 km along a footpath (partly steps); by car it takes you only a few minutes to get there. Should you be traveling and arriving by car: public parking spaces are found right outside the village center, about 200 m from Casa Marida. If you want to get around a bit between the marina, the train station and Pisciotta, you could take the Ape-taxi (max. 3 persons) of Signor Nello. A ride to the train station amounts to ca. 5 Euro per person (2018). Unobstructed view of the sea from the balcony and over Pisciotta's terracotta-colored rooftops and silvery-green olive groves. The pass-through room with sofa bed can be used as a second bedroom. Wonderful view of Capo Palinuro to the south. The bedroom with double bed. The bathroom with masonry shower cabin, WC and bidet. Wunderschöner Ort Pisciotta: familiär, Berge und Meer. Vom Balkon des Casa Marida hat man einen tollen Ausblick aufs Meer und das Capo Palinuro. Unser Tipp: Fischerfest in Marina di Pisciotta von 07. - 08.09. mit Feuerwerk. Sehr schöner Urlaub! Große Räume und tolle Lage des Casa Marida. Klares Wasser, gelassene und freundliche Menschen, abwechslungsreiche Natur. Unsere Tipps: Bar Capitano in Marina di Pisciotta, Tiramisu-Eis bei anna (Cafè auf der Piazza)und Pizzeria Tigli! Tolle Aussicht vom Balkon. Preiswerte Region, in der vielseitige Unternehmungen möglich sind. Im Vergleich zur Toskana abends viel wärmer, auf allzu viele Jacken kann im Sommer verzichtet werden. Unser Urlaub war durchwegs positiv. Wunderschönes ursprüngliches Italien! Uns hat der Aufenthalt und die Unterkunft sehr gut gefallen: Ruhe, alte Bauteile, Balkon und tolle Aussicht. Außerdem das ursprüngliche Dorfleben, die freundlichen Leute - unser Tipp: Einfach auf die Piazza setzen und schauen! Balkon mit toller Aussicht. Schöne Landschaft, sauberes Meer und gutes Essen. Lobenswert ist das Essen in der Osteria del Borgo. Unser Tipp: Wanderung bei Camerota. Wir kommen wieder wegen der ursprünglichen Landschaft, der netten Menschen, der Stille und der wenigen Touristen. Prices are valid per week for the number of persons given in brackets and include bed linen, towels and final cleaning. * 3rd / 4th person: extra charge of 35 Euro/ week each. Heating (small gas stoves) is charged on the spot according to use.